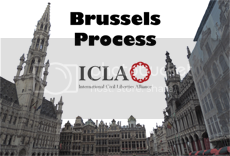 1) To commence a process, to be known as the Brussels Process, to implement the content of this declaration through education and policy initiatives at all levels of government and sectors of civil society, in order to safeguard the future liberties and rights of our nations and our children, so that all members of the human family may prosper as free individuals. 2) To decline any invitation to participate in any local, national or international forum to discuss civil liberties, free speech or human rights, if the organizers – individual persons or organizations – are known proponents of the Cairo Declaration or societal sharia enforcement unless the negotiated or discussed topic is a transition of their codification and implementation of human rights to the UNDHR definitions and away from the Cairo Declaration definitions. 3) To protest against any kind of participation in a local, national or international meeting dedicated to civil liberties, free speech or human rights’ discussions or negotiations by any known proponents of the Cairo Declaration or societal sharia enforcements, unless they are only attending in an observational capacity or negotiating their entry in the Brussels Process. 4) To initiate a thorough inquiry before any bilateral or multilateral cooperation about civil liberties, free speech or human rights related matters, in order to clearly identify any participants who are proponents for the Cairo Declaration or sharia law, or who have cooperated or collaborated with the OIC or its associated organizations. 5) To reject and forbid any public funding for promotion of the Cairo Declaration or of any sharia societal implementation and enforcement, because such promotions are a direct attack against our most fundamental democratic principles and human rights. 6) To stop any cooperation with all known proponents of the Cairo Declaration at a national or international level, when that cooperation has as its aim or result, a restriction of civil liberties, free speech or human rights in a democratic country, until those proponents repudiate the Cairo Declaration. 7) To extend cooperation and support in all forums to former proponents of the Cairo Declaration who repudiate the suppression by the OIC and sharia law of civil liberties, free speech and human rights, and who assert that human rights and liberties are universal, individual, equal, inalienable, and self-evident irrespective of philosophical, cultural or religious considerations. 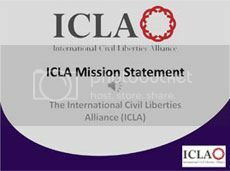 8) To engage with civil society and official organizations that work to safeguard individual liberties from suppression by shariah law, especially those located in nations that are signatories of the Cairo Declaration or members of the OIC, to encourage dialogue, education and understanding on individual liberties and human rights, as these terms have been historically understood before the Cairo Declaration.